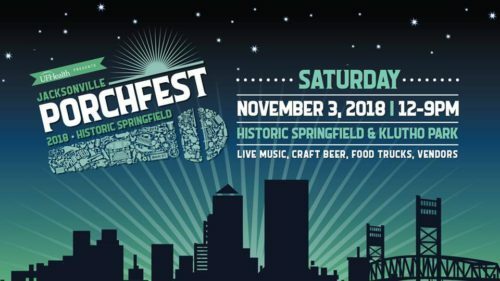 The fifth annual Jacksonville PorchFest, a music festival held on the welcoming front porches of Historic Springfield, will take place on Saturday, Nov. 3. The family-friendly, free event will feature musicians from a wide variety of genres. From noon to 9 p.m., there will be more than 20 performers on 20 porches throughout the beautiful Springfield neighborhood, followed by an evening concert in Klutho Park​. Enjoy more than 50 vendors ranging from food trucks to fine art. Proceeds of PorchFest support arts-related activities in Jacksonville’s urban core.​ For more information, click here.